Amsterdam is the largest city in the Netherlands and is its capital. It is not however the seat of government which is in The Hague. Amsterdam is known as the Venice of the north because of its network of canals. It is a very popular city with almost four million visitors every year. It is in fact the fifth most visited city in Europe. The Dutch are noted for their tolerance and liberal views and visitors enjoy the relaxed atmosphere of the city. Amsterdam is a very attractive city which because of its small size has most of its memorable buildings within a reasonable walking distance. Cyclists are well provided for with tracks and lanes and many traffic free areas. The canal network is very picturesque particularly at night when many buildings are illuminated. An Amsterdam city break offers culture, good shopping, lively nights and excellent restaurants. Amsterdam has broad ranging appeal attracting both young and older visitors. Those interested in art will find a visit to the museums with their large collections of Rembrandt’s and Van Gogh’s paintings very rewarding. Young people will enjoy the lively nightspots in this liberal city. Amsterdam has a temperate climate and can be visited at any time of year. June to August is peak season when the weather is at its best. From the middle of April to the middle of May the bulbs in the fields around Amsterdam are a blaze of colour and this spectacle attracts many visitors. Amsterdam is a very popular destination with those looking for a city break. The Dutch are a liberal and tolerant nation and this can be felt in the relaxed atmosphere of the city. The historic centre of Amsterdam is well preserved with houses and monuments from the sixteenth century. The colourful merchants’ houses that line the canals add charm to the scene. Do not leave Amsterdam without taking a romantic canal tour. Evening is best when the buildings and bridges are illuminated and the water is filled with dancing lights. There are numerous museums in Amsterdam including the Van Gogh and the Rembrandt museums. They have large collections of the painters’ works. If you wish to visit Anne Frank’s Museum it is best to go early in the morning. This sad house attracts thousands of visitors and there are always long queues. The Red Light District in De Wallen appears to be on everyone’s ‘must see’ list. Leave your cameras in your bag as the women sitting in their windows waiting for customers do not allow photographs. There are over one hundred and seventy different nationalities living in Amsterdam so it is no surprise that the hundreds of restaurants serve a wide range of international cuisine. With all Amsterdam has to offer, those choosing to take a city break here will not be disappointed. The streets of Amsterdam teem with life in the evening. The famous Red Light District at the rear of Dam Square is always busy with curious tourists wishing to see the women in their windows. It is best not to carry a camera as it is forbidden to photograph the women. There are many cafes and restaurants in this area. The city theatre is at Leidseplein along with cinemas, restaurants and a casino. Rembrandtplein is another lively area with many clubs offering a wide variety of music. Coffee shops in Amsterdam sell soft drugs to those over eighteen and only in small amounts for personal use. Buying on the street is illegal. 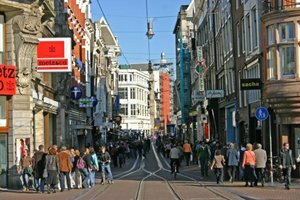 There are wide ranging shopping opportunities in Amsterdam from department stores such as Metz and Co to small specialist shops. The most exclusive street, and therefore the most expensive, is PC Hooftstraat with, among others, designer boutiques and jewellers. The busiest area with a good variety of goods is Kalverstraat. The Albert Cuyp market is renowned for the variety of its stalls and the bargains to be found. There are over one thousand restaurants in Amsterdam providing plenty of choice. The Dutch tend to eat early in the evening so restaurants don’t keep late hours. Traditional Dutch food is fairly plain but there is a great variety of restaurants serving food from around the world. Tax and tips are included in the bill so if you want to show extra appreciation 5% will do.